Hurry! only 42447 item(s) left! 2553 item(s) already purchased! Nutripath Slim Fast contains pure Garcinia Cambogia (Malabar Tamarind), green coffee and guggulextracts. Garcinia Cambogiaextract comes from a tropical fruit that's grown in Asia, Specifically South India. This fruit is used in vast proportions to add a sour flavor in cooking. The extract of this fruit is known to enhance weight management and it's one of the most common ingredients used in anti-obesity drugs. Garcinia Cambogia Extract is known as HCA. This is one of the most effective methods in controlling diabetes, cholesterol and weight loss. People looking to lose weight or control ailments like diabetes, cholesterol should buy Slim Fast pills. Green Tea Extract is clinically proven to aid in weight loss. It is one of the most commonly used ingredients in anti-obesity drugs. The herbal combination of green tea, garcinia & guggul is also known to reduce blood pressure and maintain healthy cholesterol levels. This product contains HCA, hydroxcitric acid which is effective in burning fat. It helps in curbing the unwanted hunger pangs, thus enabling one to reduce the food intake. Unlike most weight loss supplements, Nutripath Slim fast maintains high energy levels. It also helps to increase metabolic rate, which helps to burn more fat over a period of time. There will also be less fat accumulation in the body with its use. 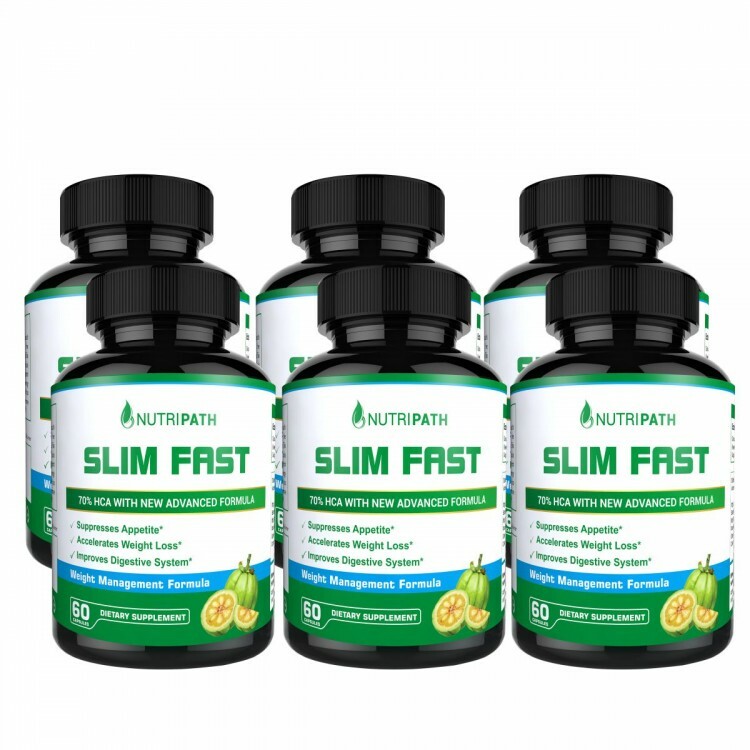 Unlike most weight loss supplements that come with a number of chemicals, Nutripath Slim Fast is natural and free from fillers or binders. This is an effective supplement which is safe and free from any known side effects. How Does Nutripath Slim Fast Work? Nutripath Slim fast contains Garcinia Cambogia, Green Tea & Guggul Extracts that flushout all the toxins from the body. This herbal combination works as an anti-oxidant and helps your skin and hair look younger. It energizes your system, making you feel better in no time. What's best is that it helps curbs those unwanted hunger pangs. This means you'll automatically eat less without even knowing it. All of our products are lab registered with the FDA/FSSAI to ensure we are delivering the best, purest and most potent ingredients right to your door. All of our products are made in India. You can now buy Nutripath Slim Fast pills online at discounted prices. Precaution: Do not take more than the prescribed dosage to lose more weight. It is meant to be taken as advised. Nutripath supplements should not be consumed by children below 18 years of age and pregnant & lactating women as it may adversely affect child's growth. Some user may experience side effects like rashes, bloating stomach or diarrhea. Stop usage immediately incase side effects persist. To be taken under medical supervision only. Disclaimer:Information on this website is for educational purpose only & is not meant to be used as a medical advice. Results shown above are not typical and may vary from person to person. This product is not indented to diagnose, treat, cure, or prevent any disease. You should consult a physician before starting any diet, exercise or supplementation program, before taking any medication or if you have or suspect you might have a health problem.